"Greetings from ACP, Nepal! On behalf of Association for Craft Producers, I would like to extend our heartfelt thanks for the generous contribution of € 23.565 for the resettlement program for our artisans and staffs affected by the earthquake of 25th April and 12th May. We are humbled by the warm thoughts and generous support of all the members of EZA and the world shop at this time of great loss and distress. Thank you very much for understanding the present critical need of our artisans. We deeply admire the effort and hard work you have put together for raising the fund for us. We feel strengthened by the knowledge that you all are always with us and have faith in us. Thank you very much for providing us the strength and courage to take on the challenge we are presently surrounded with.We feel fortunate to have a partner and well wishers like you all. Once again thanking you, warm regards, Meera Bhattarai"
Wir freuen uns für unsere PartnerInnen in Nepal über die gelebte und gezeigte Solidarität der österreichischen Weltläden und SpenderInnen! Was mit der Verlosung einer vom indischen EZA-Partner CRC gespendeten Ledertasche begann, findet bis heute seine Fortsetzung. Die Verlosung der Tasche unter den TeilnehmerInnen des EZA-Fachtages am 1. 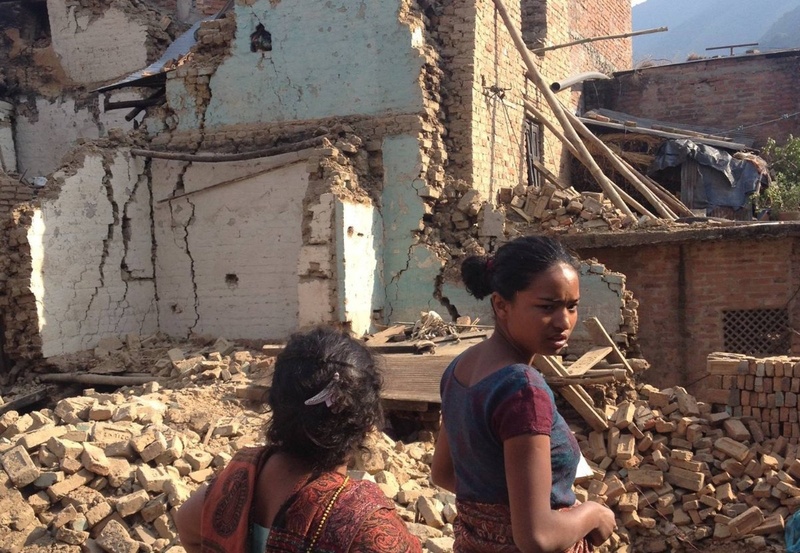 Juni brachte spontan € 890,- für die Erdbebenopfer in Nepal. Der Betrag wurde von der EZA verdoppelt und um weitere € 1.200,- aufgestockt. Wir danken Irani Sen für ihre Idee und Initiative! Seit Veröffentlichung des Spendenaufrufs gehen bei uns fortlaufend Spenden ein. Gut so, denn der finanzielle Bedarf ist groß! ACP beziffert die Kosten für den Wiederaufbau einer zentralen Webwerkstätte mit rund € 10.000,-. Vier solcher Werkstätten sollen vorerst errichtet werden, um den WeberInnen wieder einen sicheren Ort für ihre Arbeit zu bieten. Damit soll ihnen ermöglicht werden, dringend benötigtes Einkommen für sich und ihre Familien zu erwirtschaften. Denn viele Familien müssen für sich erst wieder neuen und vor allem sicheren Wohnraum schaffen, ihre Heimwerkstätten in Stand setzen. Auch dabei will sie ACP unterstützen. Dazu braucht es Geld, viel Geld! Aus diesem Grund werden wir den Spendenaufruf bis auf weiteres fortsetzen. Umso mehr freut es uns zum heutigen Tag die gesammelte Summe von knapp über € 22.000,- bekannt geben zu können. Dieser Betrag soll noch im Juli an ACP bzw. die Fair Trade Group Nepal, dem Zusammenschluss von 19 Fair-Handels-Organisationen in Nepal, überwiesen werden. Wir danken allen SpenderInnen für ihre Unterstützung. Eure Spende gibt den Menschen Hoffnung und die Chance auf eine Zukunft! Vom 23. bis 28. Mai hat in Mailand die Konferenz und Vollversammlung der WFTO (World Fair Trade Organization) stattgefunden. 270 Menschen aus 55 Nationen haben sich aus diesem Anlass in Mailand versammelt. Unter ihnen eine kleine Gruppe von NepalesInnen. Sie haben auf beeindruckende Weise über die Situation in ihrem Land berichtet: 8,1 Mio. Betroffene, über 8.000 Tote und 17.000 Verletzte. Auch die in der Fair Trade Group Nepal organisierten 19 Fair-Handels-Organisationen wurden massiv betroffen: mehr als 400 zerstörte Häuser und Werkstätten, 140 stark beschädigte Häuser, 16 Tote und 13 Verletzte, so der Stand Ende Mai. Beeindruckt hat die Stärke und Solidarität unter den anwesenden Nepalis. Sie nützten die Gelegenheit sich bei ihren Partnerorganisationen für die geleistete Hilfe zu bedanken und um weitere Unterstützung zu bitten: "DANKE! Aus den Trümmern sind wir aufgestanden, haben uns den Staub abgeschüttelt und mit dem Wiederaufbau begonnen. Wieder aufzustehen wäre ohne eure Gebete und Unterstützung nicht leicht. Danke vielmals, dass ihr bei uns ward, als wir es am meisten brauchten!". Greetings from ACP! Thank you very much for your deep concern and well wishes. We also very much appreciate the efforts you are making for raise funds. (...) People live in constant fear and the continuous after shocks worsens the situation. (...) Many people refuse to go into their homes. They are living outside in the open area in the tents. (...) We remained closed on 13 and 14th. Considering the present state of mind of our staffs and producers, we have reduced the working hours of ACP and our shop. Regarding the status you have requested, please find below some information: Most of our weavers at Kritipur have either lost their homes or it is no longer habitable. All the women here are home based producers. All of them have the looms were at the basement of their home. Until they have their house rebuilt or unless alternatives are found they cannot continue their work. We have group of 7 weavers in Thankot. (...) Their situation is same as of kirtipur. Village of our Leather Producers, Sindhukot, has totally been wiped out. The total of 150 households (among this we have 11 producer families) has been flattened. Some of the producers have lost their family members. Most our felt artisans have migrated to Kathmandu from Sindhupalchowk and Kavre which are one of the most affected areas. So, many of them have lost their homes at their villages. We do not know about the human casualties there as the producers have not returned from their villages yet. Homes of ceramic artisans have also been affected. Some of them lost their older houses while many of the workshops are cracked as well as lot of their significant amount of their production has been damaged. Apart from the above, many of out individual producers, knitters, stitchers, in-house producers and staffs have their houses into rubble or no longer inhabitable. Some of them have also lost their family members. Concerning ACP, we had a thorough inspection of our buildings and reaffirmed there are no structural damages. This is indeed a huge relief for us. However, there are some areas which needs immediately repaired to ensure our working environment is safe for the days ahead. Please see our facebook (www.facebook.com\acpnepal) for pictures. As we shared with you earlier, the quake has rendered our producers homeless and also not being able to work due to the loss of their homes which is also their work place. We are trying to raise funds for supporting our artisans/ staff to rebuild their house. Any support provided would be assist us in our endeavour to reconstruct, resettle and continue our effort to provide life of dignity to our producers. Greetings from ACP! Thank you very much for all your warm thoughts at this time of national disaster. (…) It is tragedy all of us will remember for a long time. (…) The tremors continues as we try to come out of traumatic situation and struggle to get back to normality. ACP has not remained immune to this nature's fury. ACP buildings have also suffered. Many cracks have appeared and some walls have fallen apart. In the meantime, there are certain areas which needs to repaired, pulled apart and reconstructed with high priority. Many of our staffs and producers have lost their houses and significant numbers' homes are no longer inhabitable. Some human casualties of family members have also been reported. We do not have the exact status of this yet. The village of our leather producers have been completely wiped off and we have learnt many lives have been lost there. Due to communication trouble we have not been able to get proper information from there yet. After the immediate relief response ACP plans to provide settlement support to our people. We need your support, guidance and well wishes in our endeavour to reconstruct, resettle and continue our effort to provide life of dignity to our producers. Greetings from ACP! Thank you for your thoughts and wishes! We are all terrified here of the current situation. Till yesterday, everyone was alerted to stay outside and safe. So, about 95% of the people stayed for last 4 days in an open shelter in a tent. Slowly, people are going back home but still are terrified. Many of the houses, historical temples have been collapsed and death rate has reached 5,000 people. Still efforts are being made to take people out of traps. We did not have internet! So, could not reply to your mails before!